Mold and mildew can be found almost anywhere. They’re able to grow on virtually any organic substance, as long as moisture and oxygen are present. When excessive moisture accumulates in buildings or on building materials, growth will often occur. Canberra’s Husky line offers two ready-to-use solutions that combat existing mold, inhibit future mold growth and remove unsightly mold and mildew stains. Husky 416 Mildew Stain Remover cleans and brightens mold and mildew stains. 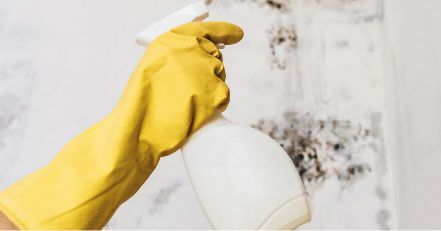 This ready-to-use product can be used anywhere mold and mildew stains are present including tile, grout, showers, counters, sinks and basement walls and floors. Husky 418 Mold Control is a ready-to-use spray cleaner that crushes mold spores at the roots and leaves an invisible barrier on the surface that provides protection against future growth. Used to pre-treat building materials can provide mold resistance and is ideal for mold remediation & prevention following flooding and water damage cleanup. This non-toxic formula is safe to use on hard and soft surfaces including wallboard and fabric upholstery. Get control of existing mold and mildew issues in schools, offices, hotels, gyms and restaurants and prevent future issues in any facility where mold issues commonly occur.